What doesn’t pesto work with? You could rub it on my shoe and I would eat it. 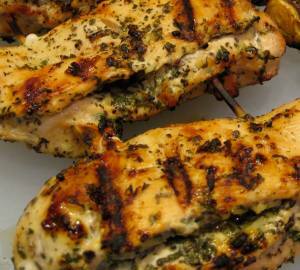 But add it to some chicken & grill it and you have this great easy chicken recipe you will want to share with everybody. the chicken to coat and place in the refrigerator to marinate overnight or up to 2 hours. 2. Preheat an indoor or outdoor grill. Lightly oil the grate. 3. LIGHTLY season chicken with salt, black pepper, garlic powder and onion powder. 4. When the the grill is hot and ready, cook chicken about 5 -7 minutes on each side until cooked through and juices run clear. Remove chicken from the grill, Cover with foil and let chicken rest for a few minutes. Posted on August 16, 2012, in Lady Fab Cooks and tagged basil pesto, boneless skinless chicken breast, dinner, food, lunch, Pollo Vegetarian, recipe, the porter house grille. Bookmark the permalink. 2 Comments. That looks delicious! I will try this..love chicken love grill love pesto! perfect :). It is REALLY good! Husband requested it for his birthday dinner.